MANHATTAN (CN) – The national network for organ sharing imposes arbitrary and illegal geographical boundaries for donations, according to a federal lawsuit filed by a group of patients waiting for liver transplants. According to the complaint filed Friday in Manhattan federal court, despite advancements in modern medicine allowing for livers from deceased donors to be portable and safely preserved for up to 12 hours, the Department of Health and Human Services’ current “illegal and inequitable” region-based allocation policy results in the deaths of many people on the waiting list. Represented by Motty Shulman from New York firm Boies Schiller Flexner LLP, the six plaintiffs waiting for liver transplants seek a court order to bring the nation’s organ transplant program into compliance with the law. The complaint alleges that the 58 donation service areas in the Organ Procurement and Transplantation Network are arbitrary determined and contrary to the Organ Transplant Amendments of 1988, which did away with a previous policy that prioritized locality. The network is regulated by the Department of Health and Human Services. According to the 47-page complaint, under the current allocation policy, a candidate receiving a liver may be both less sick and geographically further away from the donated liver than a candidate with higher medical priority. “Despite the portability of livers, plaintiffs who are registered for liver transplants in California, Massachusetts and New York will likely need to wait several years for a transplant, while less-sick candidates 500 or 1,000 miles away will receive transplants in several weeks or months,” attorney Shulman wrote in the lawsuit. The suit claims that a policy of equitable and appropriate zone-based liver distribution is opposed by groups who want to protect the strong financial benefits afforded to transplant programs in areas with short waitlists. “The size and scope of the DSAs and regions bear no relationship to population, geography, transportation logistics or medical need. Some DSAs are 1,000 miles wide while others are less than 100 miles wide. Some DSAs have populations as small as 1.4 million, others as large as 20 million,” the lawsuit states. A spokesperson for the Department of Health and Human Services declined to comment on the pending litigation. 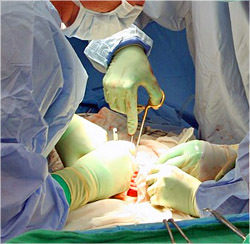 First signed into law in October 1984, the National Organ Transplant Act authorized the secretary of Health and Human Services to make grants for organ procurement organizations and created the Organ Procurement and Transplantation Network and created the Scientific Registry of Transplant Recipients. The law also made it a crime to sell organs. As originally passed, the law envisioned a “local first” distribution of organs, in which organs would first be made available to local matching candidates and thereafter be offered for distribution more broadly. But that policy was reversed by Congress with the Organ Transplant Amendments of 1988, which removed language references the prioritization of local distribution. The Department of Health and Human Services operates the Organ Procurement and Transplantation Network with its contractor, the Richmond, Virginia-based United Network for Organ Sharing. The network uses 58 organ-procurement organizations throughout the United States, which are responsible for getting deceased donor organs for transplantation. They operate in the designated donation service areas, which are grouped into 11 regions. According to the complaint, as of September 2017, the United Network for Organ Sharing had net assets of $47.5 million and annual revenues of over $77 million. A study made public in April found that as the opioid epidemic has escalated in the United States, a rise in the number of drug overdose deaths has contributed to a rise in organ transplants across the country.